What Works With Google Home? Google Branded products, such as Chromecast, Chromecast Ultra, Chromecast for Audio. Products with Google Chromecast built-in. Smart Home devices from more than 150 partner companies that include over 1,000 products, such as security cameras, doorbells, locks, thermostats, lights, switches, power outlets/plugs, and more. If you can't confirm Google Home compatibility via package labeling, check the product's official webpage or contact that product's customer service. Google Chromecast devices are media streamers that need to connect to an HDMI-equipped TV or stereo/home theater receiver. Typically, you need to use a smartphone to stream content through the Chromecast device to see it on a TV or hear it through an audio system. However, if you pair a Chromecast with Google Home, a smartphone is not needed to control the Chromecast (although you still can). There are a number of TVs, stereo/home theater receivers, and wireless speakers that have Google Chromecast Built-in. This allows Google Home to play streaming content on such a TV or audio device, including volume control, without the need to plug in an external Chromecast. However, Google Home can't turn TVs or audio devices on or off that have Google Chromecast Built-in. Chromcast Built-in is available on a growing number of TVs from Sony, LeECO, Sharp, Toshiba, Philips, Polaroid, Skyworth, Soniq, and Vizio, as well as home theater receivers (for audio only) from Integra, Pioneer, Onkyo, and Sony and wireless speakers from Vizio, Sony, LG, Philips, Band & Olufsen, Grundig, Onkyo, Polk Audio, Riva, Pioneer. Here are select examples of the over 1,000 possible products that can be used with Google Home. NEST - Thermostats and Security Cameras: With Nest Thermostats you can use Google Home to tell you the current room temperature, as well as raise or lower it generically (warmer/cooler) or to a specific temperature. If you have a Chromecast connected to a TV or a TV with Chromecast built-in, you can ask Google Home to show video from your NEST camera on your TV. Philips - HUE Lights: If a Google Home is linked with a Philips HUE light system, Google Home can be used to turn lights on or off. If you have Philips HUE color-changing lights, you can ask Google Home to change the color of the lights. If you have HUE lights in multiple rooms, they can be assigned so that Google Home can control them separately. August - Smart Lock: If you link a Google Home with an August Smart Lock, you can command your Google Home to ask August to lock or unlock your door. Also, if you have multiple locks, you can use Google Home to control them individually. Samsung SmartThings: This is a collection of products that include lights, smart outlets, thermostats, and even a leak detector! Using a SmartThings hub as a gateway, you can use Google home to control all SmartThing device tasks such as turning lights off and on and adjusting thermostats. Also, using smart plugs, you can turn on ordinary devices and lights that may be plugged into them. Logitech - Harmony Remote Control: You can use Google Home to control a lot of devices, but they have to be Google Home compatible. However, you may have a lot of home entertainment devices (TV, home theater receiver, DVD/Blu-ray Disc player, media streamer, game console, cable/satellite box, etc...) aren't. As a workaround, if you have a Logitech Harmony Elite or a Harmony remote that works in conjunction with a Harmony Hub to control your home entertainment devices, you can link the Google Home with the Harmony Remote system. Using the Harmony Remote/Hub as a bridge, Google Home can ask it to turn your TV, Roku, or Xbox on or off, go to a specific TV channel (either by name or number), go to Netflix or Hulu on your media streamer, raise and lower volume, and more. Blossom - Smart Sprinkler System Controller: If you have an electronically controllable sprinkler system, you can replace its controller with the Google Home-compatible Blossom. Once linked, you can use Google Home to ask Blossom to water your lawn. You can even designate it to stop after a specific time period. GE - Select Wi-Fi Connected Appliances: If you have a GE refrigerator, stoves/range, wall oven, dishwasher, washer/dryer, or air conditioner that use the Geneva Home command interface, you can use Google Home to ask Geneva to perform operations on a specific appliance, such as pre-heat the oven or start the dishwasher. PetNet Smart Feeder: With the PetNet Smart Feeder, you can use Google Home to manage your pet's nutritional needs. 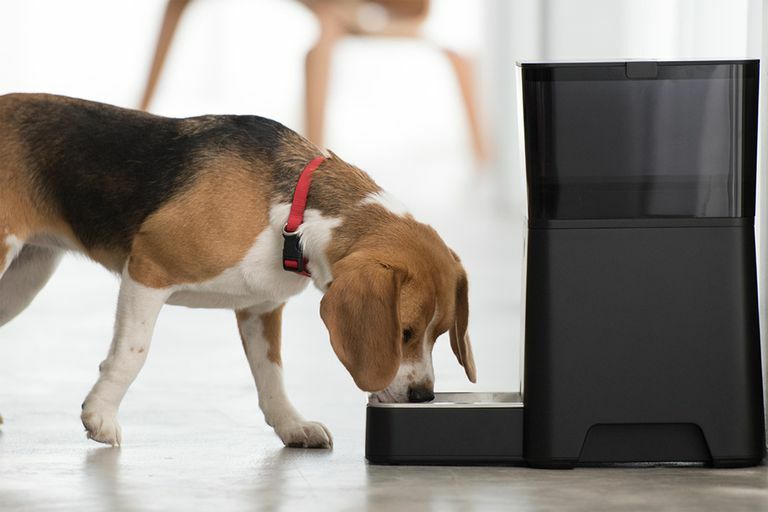 The Smart Feeder can store several pounds of food, and dispense the correct amount needed by your pet on a schedule you set - or, using Google Home, you can tell the smart feeder when, and how much, to feed your pet. Google Partner products come with what you need to get started. For example, for TVs, a Chromecast has an HDMI connection and power adapter. Products with Google Chromecast built-in are already set to go. For stereo/home theater receivers and powered speakers, Chromecast for Audio has an analog 3.5 mm output for connection to the speaker. If you have a receiver or speaker that has Chromecast built-in already, you can pair it with Google Home directly. For Google Home compatible thermostats, smart switches, and plugs (outlets) you supply your own heating/cooling system, lights, or other plug-in devices. If you want a complete package–look for kits which contain several smart control items in a single package, along with a hub or bridge that allows communication with a Google Home. For example, a Philips HUE starter kit includes 4 lights and a bridge, and with Samsung SmartThings, you can start with a hub and then add compatible devices of your own choosing. Even though products or kits may be compatible with Google Home and Assistant, they may also require the installation of their own smartphone app, which enables your smartphone to perform initial setup and also provides alternate control method should you not be near a Google Home. However, if you have multiple compatible devices, it is more convenient to use Google Home to control them all, rather than having to open up each individual Smartphone app. Go to Devices and tap Add (or the + icon on the bottom right of the screen). When linking/pairing is completed, just tap Done. You can then control the device through Google Home via verbal commands. In addition to Google Home, there are a select group of non-Google Home products that also have Google Assistant built-in. These devices perform most, or all, of the functions of a Google Home, including the ability to interact/control Google Partner products without having an actual Google Home unit present. Products with Google Assistant built-in include: Nvidia Shield TV media streamer, Sony and LG Smart TVs (2018 models), and select smart speakers from Anker, Best Buy/Insignia, Harman/JBL, Panasonic, Onkyo, and Sony. Google Assistant is also built into a new product category, "smart displays," from three companies, Harman/JBL, Lenovo, and LG. These devices are similar to the Amazon Echo Show, but with Google Assistant, rather than Alexa. Many of the brands and products that can be used with Google Home can also be used with Amazon Echo products and other branded Alexa-enabled smart speakers and Fire TV streamers, via Alexa Skills. Check for the Works with Amazon Alexa label on the product packaging.